We have also compiled a list of some of the best bed frames for Sleep Number Mattresses that will work great. Let’s get started! We’re going to open up this list with the Zinus 14-Inch SmartBase Mattress Foundation. The Zinus 14-Inch SmartBase Mattress Foundation is a simple yet sturdy metal frame that provides the support your Sleep Number mattress needs without the complicated features of other bed frames or the hefty price tag. This bed frame offers 13 inches of clearance underneath, which is perfect for those who are looking for a frame that will give them the room needed for extra storage, a compact design that makes it easy to move it anywhere without having to hassle, an easy setup process that takes a matter of minutes, and headboard attachment capabilities so that you don’t have to skip out on the option if you have your heart set on one. Although this is a very simple bed frame, it seems to have no apparent issues that could make it a poor purchase and almost everyone who has purchased it has been satisfied with how it functions. The only downside that could be noted is the lack of aesthetic due to its simple, metal build. If a simple, affordable, fully-functional bed frame is on your list, the Zinus 14-Inch SmartBase Mattress Foundation is definitely the first option that you should explore. 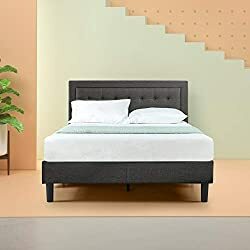 For those who are looking for a more attractive option, you may want to look into the DHP Dakota Upholstered Faux Leather Platform Bed Frame. 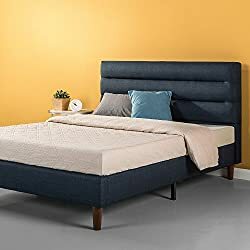 The DHP Dakota Upholstered Faux Leather Bed Frame is an affordable, sturdy, wooden bed frame that features an attractive upholstered faux leather design that reaches both its headboard as well as its footboard. The design is a button tufted look that comes in a variety of different colors to match any style that you room may feature. Your bed frame can also come with or without drawers, a great feature for those who need the extra space but who would not be able to get it with the low hanging side pieces on this product. Speaking to the overall functionality of this product, this bed frame utilizes a sturdy wooden frame design and an even sturdier wooden slat system to keep your mattress supported throughout the night. This bed frame also provides an additional metal side rail system that keeps the mattress so that it remains firmly in place regardless of how often you shift around during the night, which is a valuable feature as most bed frames with wooden slat systems are susceptible to moving around quite a bit. The bed frame also boasts an impressive 500-pound limit and a quick assembly process. Much like the previous product, a lot of people are happy with this purchase and say that it does the job well. The only thing that needs to be kept in mind is that it is a wooden piece so if you do not use it correctly, you are definitely at risk of breaking it, which can impact the overall usability of the product. Some bed frames are functional and some frames are stylish. Then there are those bed frames that are capable of being both at the same time. If you are in need of a reliable bed frame that also meets your style expectations, purchase the DHP Dakota Upholstered Faux Leather Bed Frame. The Metro Shop LeAnn Graceful Scroll Bronze Iron Queen-Sized Bed Frame by Tribecca Homes is the perfect mixture of the two previous products that we listed, giving users the sturdiness and durability that comes with a metal bed frame while also providing them with the style and the grace that you would only typically find in wooden bed frames. To begin with, let’s review the design of this bed frame. The Metro Shop LeAnn Graceful Scroll Bronze Iron Queen-Sized Bed Frame by Tribecca Homes is an intricately designed bed frame that features beautiful curves, a Victorian style design that is reflected in the bedposts on the corners of the bed, and a shiny iron look that further enhances the overall elegance of the piece. Overall, the design is beautiful and shouldn’t be a problem for anyone who is concerned with style, even though this is a simple metal piece rather than a wooden one. Now that we’ve taken a look at the overall style and feel of the piece, let’s take a look at the functionality. This piece is quite sturdy and will easily be able to support your Sleep Number mattress, with an estimated weight limit of around 1000 pounds. Unlike some other metal pieces, this one features two center legs that help to support the center so that the mattress does not sag down over time. This piece also eliminates squeaking and is great for those who don’t want to make noise when they are getting up in the middle of the night. The bed frame functions as stated and users are happy but the only downside is the heaviness of the pieces and the long setup process that is required of the user. 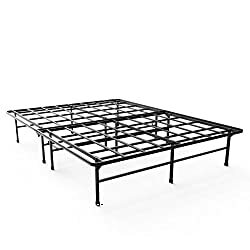 Our two previous mentions were great but we have to say that the Metro Shop Leann Graceful Scroll Bronze Iron Queen-Sized Bed Frame by Tribecca Homes is one of the best pieces for those who need a stylish, minimalistic yet supportive bed frame. The Sleep Number Mattress is great but it is only as good as the bed frame you have. With this guide, you will be guaranteed to find the right bed frame for you and you will have a couple of great suggestions that will help you with the process! Sleep Number mattresses are one of the few mattresses that have become a household name and for good reason. These mattresses are able to adjust to your needs so that you can get the sleep experience that you need. While the mattress itself may be fantastic, however, what people often forget to take into account is that a mattress is only good as the bed frame underneath it. After all, you can’t have an amazing sleep experience if your bed frame isn’t properly set up to ensure that your mattress can function as desired. If you have recently purchased a Sleep Number mattress but you want to make sure that you are only getting the best sleep of your life, take a look at our extensive guide on some of the best bed frames for Sleep Number Mattresses. The bed frame that you select is going to be based entirely on your personal tastes and preferences. That being said, there are some general characteristics that almost everyone looks for when they are shopping around for a bed frame. If you have just started looking around for your bed frame but are unsure of what you should be looking for, here is a brief bed frame buyer’s guide that will assist you in the process. Durability is a common feature that everyone is going to need in their bed frame. No one wants to purchase a bed frame that sags in the middle or breaks after a few months of use. This is a given. However, durability is and support are both must-have features that you cannot negotiate on when you are sleeping on a sleep number mattress. The support that your mattress provides is only as good as the support that your bed frame is providing for your mattress. One way to make sure that your bed frame is going to be supportive and durable is by checking the material that it is made out of. Bed frames are typically made out of two kinds of materials, wood or metal. Metal comes the most heavily recommended as it tends to last for a longer period of time if it is a strong type of metal and features the right design to keep the mattress supported in all areas. Most woods are great and look amazing too but there are some that may crack easily if you are not careful enough, which can be a big disadvantage rather quickly. Although this isn’t necessarily a big component of whether or not your mattress will function properly, style is often the next big factor that you need to consider. Bed frames come in a variety of shapes, sizes, and styles but only a select few may match with the rest of your room. Material comes into play in this section as well as wooden frames tend to be the most attractive while metal frames can look good but aren’t generally designed with aesthetic in mind. Make sure that you take style into consideration when you are first searching for a bed frame to avoid one that hurts your eyes when you walk into your room. Yet another factor that can have a major impact on your sleeping experience, you need to double check the size of any bed frame with that of your sleep number mattress. If your mattress doesn’t fit into the bed frame perfectly, you run the risk of having the mattress sliding out of place constantly and not providing you with the right support. When you find a bed frame you might like, always check the dimensions of both your Sleep Number and your bed frame to see if they line up. For some, a bed frame that supports the mattress is enough. For others, however, they may be looking for a bed frame that goes above and beyond to provide a superior experience. For example, maybe you are in need of a frame that adjusts up and down so that you can sit up and enjoy a good book or watch television. Maybe you are looking for a frame that features a light system so that you can better see the area around you when you get up in the middle of the night. Perhaps you want a bed frame that is capable of giving you a massage when you are lying down after a long day of work. Regardless of what your personal wants may be, take this into consideration when you start shopping. We all know that one person that uses the area underneath their bed as their own personal storage shed. Depending on the height of a bed frame, some frames are capable of holding an impressive amount of belongings underneath them. While this may not be something you were considering when you were thinking about what bed frame you wanted, a frame storage capabilities can be a useful feature if you have a lot of things in your house and need more room to put your belongings. You may even be able to find a bed frame that has drawers at the bottom and on the headboard. Another quality that often slips people’s minds is the ease-of-use and the ease of assembly or disassembly when it comes to bed frames. Although some frames may look great, some may take hours upon hours of assembly to set up and if you feel like moving it or even disassembling it to move it to another part of the house, you are going to have to go through that entire process. If you are someone who is not bothered by having to put together and take apart furniture, you have plenty of options at your disposal. If you are someone who is bothered by this, however, you have to make sure that your bed frame doesn’t demand too much of you when you are looking for the right one.